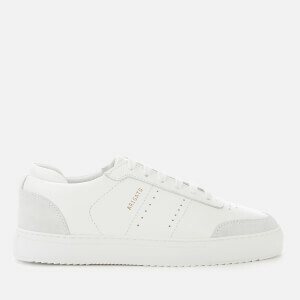 White leather ‘Platform’ sneakers from Axel Arigato. Handcrafted from premium Italian leather, the women’s sneakers are designed with a gold-tone foil logo on the vamp and a chunky rubber platform sole. The sole has been stitched and glued for increased durability and a cemented design ensures the original shape is maintained. Fitted with a cushioned footbed, a reinforced padded heel and arch support for long lasting comfort. Includes a branded dustbag and chopsticks.